Cycling, for all it’s controversies, is with soccer one of the most universally participated sports the world over. The competition to even make it onto a professional team participating in the World Tour is incredibly fierce and the racing itself, particularly though the 3 week grand tours, is almost unbelievably brutal in both it’s physical and mental requirements. Riders who hope to get over the mountains of France, Spain and Italy at the pointy end of the field need to be as light as jockeys regardless of their height, yet have the strength to generate incredible amounts of power through the pedals. Whether it be climbing up a 20% gradient for 10+ km’s or hurtling down the other side at speeds sometimes exceeding 100kmh, these guys and girls put the ‘elite’ in elite athlete. Grand Tour champions therefore tend to be hitting their peak in their mid to late 20’s, with the toughest races of the sport seen to be too taxing on riders to really compete for the overall win beyond that age. Evans, now 37, became one of the oldest winners of cycling’s most prestigious event, the Tour de France, when he lifted the trophy on the streets of Paris in 2011. He was desperately unlucky not to have already have won the Tour a couple of times, a combination of circumstances surrounding riders later disqualified for drug cheating and the shortcomings of most of the teams that have been sent to that race to support him robbing him of two or three gilt edged chances, two of them leaving Evans owning the 2nd and 8th smallest losing margins in the history of the race. That being said his honor roll of a win, two incredibly close 2nd places, a 4th, 7th and 8th in le Tour has him ranked among the very best of the modern era in that event. Combine those results with a podium at both the Giro and the Vuelta along with a couple of other top 10’s at those events, as well as winning the prestigious World title Rainbow jersey in the Road Race in 2009 and he’s had the kind of career that most never expected an Aussie could have on the cycling world stage. Evans is also one of the few cyclists to have competed at the top end of the sport through the early part of the 2000’s never to have had the suspicion of doping hang over him. No rider in the professional peleton is seen as a fairer or better example for the sport, and we dare say none loves the sport more. Certainly his Tour win in 2011 greatly increased Evans’ exposure in Australia. The scenes when he returned to Melbourne after his triumph to tens of thousands of people lining his route to Federation Square truly had to be seen to be believed, it was the kind of adoration normally reserved in Australia for local sporting heroes the likes Don Bradman or Ted Whitten, certainly not for a cyclist who does his best work on the other side of the planet. Still, a few years on from that incredible day you get the feeling that if not for his trademark dimpled chin Cadel could sneak around the major city of his home state largely unnoticed, save for the cycling fans who spend the month of July in a kind of waking sleepwalk every year. As a nation we idolize our cricketers, Aussie Rules and Rugby League footballers – but none of those sports have anything like the worldwide participation or competition of cycling. Basketball and particularly Soccer are played the world over, but despite the huge successes of the likes of Andrew Bogut and Harry Kewell, Australia certainly can’t lay claim to having had the best in the world at either of those sports at any given time, let alone one of the very best of a long time. Perhaps more recognition will come after Evans inevitably retires in (hopefully at least) a few years, perhaps he’ll be favorably compared to Bradman, Coleman, Fraser, Norman, Thorpe, Laver and the like at that time. In the meantime those of us pulling the late nights in the Australian winter will have to wait a little longer this year to catch a glimpse of that iconic if somewhat unorthodox riding style as Evans climbs all over his BMC machine hopefully on the way to another top 10 in the Vuelta a España in late August. Update : We received the following response from Cadel after the article was shared with him via twitter. @PaulSCousins Thank you Paul… I certainly want to ‘ride on’! He’s a great cyclist but there’s something about him that makes him different to most top riders. I admired his tour win and his recent Giro ride was probably his best in someways, but top cyclists don’t cry, well not in public after they win. I can’t imagine any other tour winner crying. Probably the best Australian cyclist if you look at his finishing places but compared to Russell Mockeridge and how he raced and the conditions under which he raced Evans is not quite the best. @cadeloffical inspirational and arguably Australia’s greatest athlete. I love him dearly, watch him any chance I can and believe he is undervalued for a few reasons, but he is by far our greatest champion if you consider the power, stamina, speed and skill required to even finish a grand tour let alone at the front of ~160 of the worlds best. 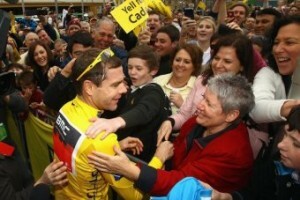 Go Cadel! In 2011, when Cadel won, I was lucky enough to be in France watching Le Tour with a bunch of crazy Australians… including the crocodile man himself. I was taking pictures on the last time trial and Cadel was riding so fast he went right out of the frame before I could take a snap. 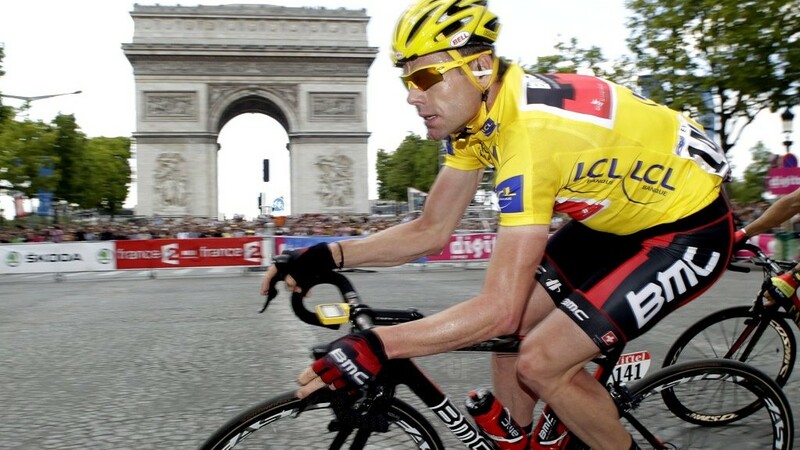 Cadel is truly a great sportsman and phenomenal cyclist, and he’s been a pleasure to follow all these years. Completely agree Dave, great story from you, many will be jealous reading it! 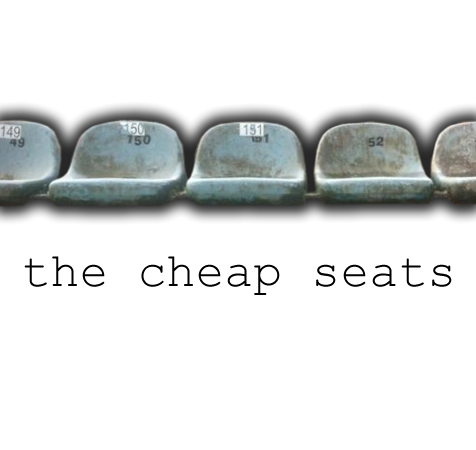 TCS.